There are millions of searches for hotels everyday on Google — that’s millions of potential hotel bookings. We want to help hotels reach and engage travelers, make it easier for travelers to search for hotels online, and visually and textually communicate why a particular hotel is the right fit for them. We’ve been evolving the way hotels appear in search results on Google to include more structured, relevant and dynamic information — like rates, availability, locations, user reviews, editorial descriptions, Google Street View, and high resolution photos. As part of this evolution, we’ve created Hotel Ads — an advertising format designed specifically for hotel-related searches. Hotel Ads show current prices for hotels from a variety of partners and help travelers narrow down their options. When a traveler is ready, they can select “Book” and complete their reservation with the partner. Because Hotel Ads appear when travelers are already engaged and ready to book, hotel partners have seen great results. Hilton Worldwide started using Hotel Ads in 2011 and has now implemented Hotel Ads with all of its 4,200 hotels. “Compared to other search formats, Google Hotel Ads has delivered a 45% higher conversion rate. It reaches a massive audience and the distribution cost has been good,” said Dustin Bomar, vice president, Digital Acquisition, Hilton Worldwide. Check out the video below or read the case study on Think with Google to learn more about Hilton’s success with Hotel Ads. Premier Inn, the UK’s largest hotel chain, also used Hotel Ads to attract new customers who haven’t stayed with them in the past. "About 30% of the UK population has stayed in a Premier Inn. Hotel Ads is a way that we can reach the remaining 70%, as well as the huge number of inbound international travelers who know less about our brand," said Aurelia Noel, Head of New Channel Development, Premier Inn. Find out how Premier Inn captured 40% more bookings from new customers at a 60% lower cost per acquisition with Hotel Ads here. To get started on Hotel Ads, contact one of Google’s authorized partners listed here: google.com/ads/hotels. 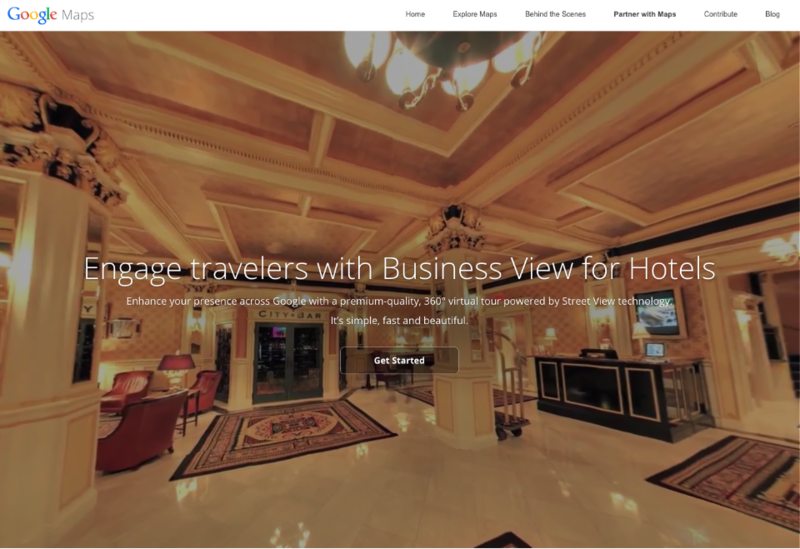 We’re also building products for hoteliers to help showcase properties and engage with travelers visually. 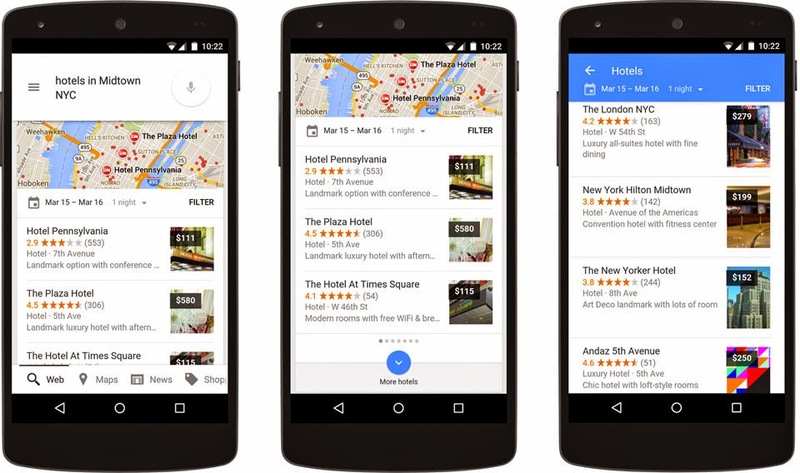 Google My Business helps ensure that hotels’ information and photos reach travelers when they’re searching on Google and Google Maps. Our improved photo tools let hotels easily change the image that appears when travelers are searching. It’s also now possible to add photos specifically for food and beverage, individual guest rooms and common areas. 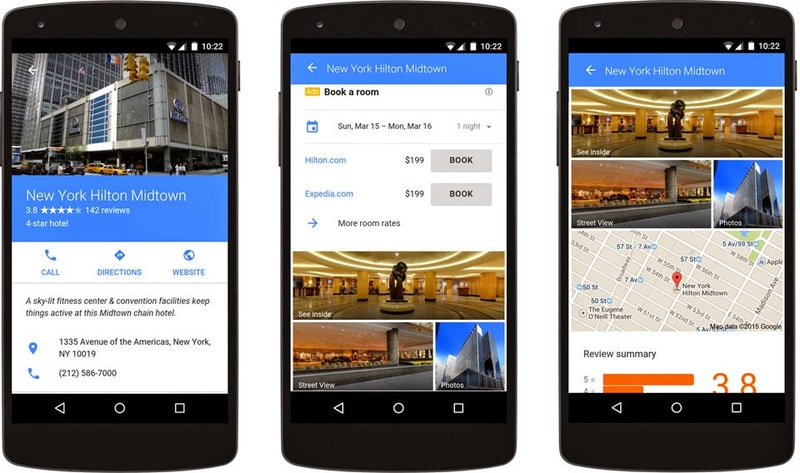 In addition to uploading photos, Google now offers the ability to add premium-quality, 360° interactive tours of a hotel’s interior with Google Maps Business View, powered by Street View technology. These virtual tours show up on Search and Maps and let travelers experience the hotel — all before they book their stay. We’re excited to improve the hotel search experience for both travelers and hotels through content and photo-rich results, Hotel Ads, Google My Business and Business View. Throughout 2015, we’ll have more features that will help connect hoteliers with travelers when they’re dreaming about a trip and once they’re on their way.